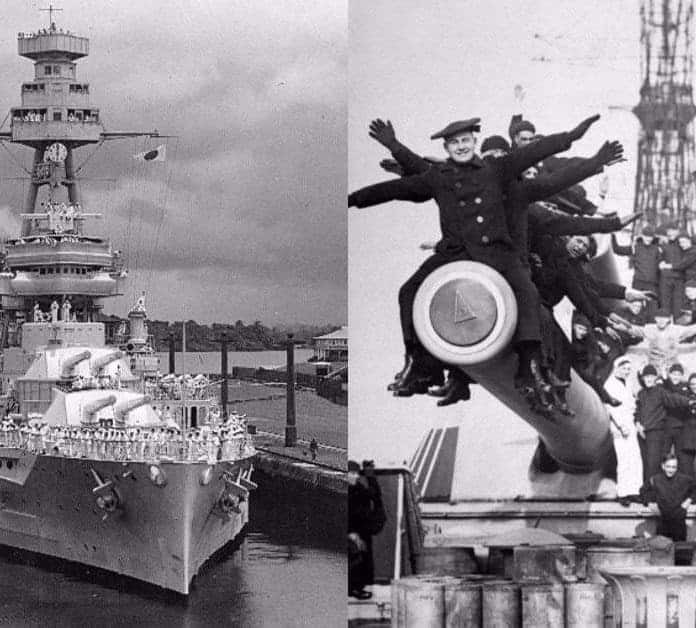 In the history of the United States Navy, few ships can match the remarkable reputation and achievements of the USS Texas (BB-35). Commissioned in 1914, she is one of a few surviving battleships to surpass the century mark. Only a handful of naval vessels can boast similar claims, including Japan’s Mikasa and England’s HMS Victory. Unlike that pair of vessels, however, the USS Texas remained on active service through the Second World War. What follows is a brief list of accomplishments that highlight the extraordinary character of the USS Texas, a remarkable ship unlike any other in the U.S. Navy. Inspired by the British Royal Navy’s HMS Dreadnought, which was launched in 1906, the USS Texas belonged to an entirely new class of battleship—one which projected naval power via its incredible steam-powered screws and thunderous batteries of large-bore guns. The HMS Dreadnought was so massive, in both scale and power, she ignited an incredible arms race between the great naval powers of the early twentieth-century. Dreadnoughts quickly became symbols of national sovereignty and strength, changing the very nature of naval warfare in the virtual blink of an eye. The United States quickly entered this foray, launching its South Carolina and Delaware-class of battleships within a few short years. While these new U.S. battleships easily outperformed earlier pre-dreadnought warships, they were not without limitations. The USS South Carolina (BB-26) and the USS Michigan (BB-27), launched during the first decade of the twentieth-century, represented America’s first generation of dreadnoughts. Congressional and budgetary constraints restricted the size of these ships to 16,000 long tons, a much smaller displacement than other nations’ battleships, which typically exceeded 18,000 long tons. Even more concerning was the speed and armament of these early American vessels, both of which were outclassed by the HMS Dreadnought. The second generation of American dreadnoughts, the Delaware-class battleships, corrected several design oversights, including previous displacement limitations imposed by Congress. The USS Delaware (BB-28), launched in 1909, was the first U.S. warship to exceed 20,000 long tons while also matching the speed and firepower of the British dreadnoughts. Subsequent classes of American dreadnoughts improved upon previous designs, with the New York-class of battleships featuring displacements exceeding 27,000 long tons, improved firepower, and thicker armor. Preceded by the Wyoming-class of battleships, the USS New York (BB-34) and the USS Texas (BB-35) represented the pinnacle of American naval power, both being launched in 1912. For the most part, the dreadnought-generation of battleships eventually fell into disuse. Like the vessels before them, dreadnoughts were soon outclassed by even larger and more heavily-armed warships, called the “super-dreadnoughts.” The Washington Naval Treaty of 1922 additionally and ostensibly called for the mutual decommissioning or scraping of dreadnoughts between the major naval powers of the period. Ulterior motives and political incentives aside, many battleships were scuttled or otherwise removed from service to meet this requirement. The USS Texas avoided the chopping block, however, and remains the world’s only surviving World War I-era dreadnought.